Tesla has been on a winding road recently. A few weeks ago, the company said it would lay off 3,000 people—almost 10% of its workforce—to rein in expenses. Then, last week, it reported a profitable quarter, only its fourth in 15 years. This week, Tesla announced that it will spend $218 million in an all-stock deal to acquire battery company Maxwell Technologies. When complete, Maxwell will become only the fifth acquisition by Tesla since its founding in 2003. Neither Tesla nor Maxwell have said much publicly about the rationale for the deal and declined to answer Quartz’s questions. In the meantime, Quartz spoke to industry executives and analysts to run through some theories. When Tesla boss Elon Musk first came to California, he wanted to pursue a PhD at Stanford studying ultracapacitors. He ended up becoming an internet entrepreneur instead, which generated enough money for him to buy a controlling stake in Tesla. He clearly hasn’t lost the love for ultracapacitors, which is what Maxwell, founded in 1965, is known for making. Ultracapacitors are, like batteries, energy-storage devices. The difference between the two is best understood with an analogy. Because batteries store energy in electrochemical form, it takes time to charge and discharge them. It’s like the time it takes for a dam to fill with rain during the year, and then slowly drain as it turns turbines to generate electricity. Ultracapacitors, on the other hand, store energy in electrostatic form, which means they can charge and discharge rapidly. This is like routinely opening the floodgates in a dam as it rapidly refills with torrential rain. Fast charge and discharge should make ultracapacitors better than batteries. But ultracapacitors come with a serious limitation: the total amount of energy they store is only a fraction of what can be housed in batteries. To run electric cars on ultracapacitors alone, you would need so many of them that the car would be too heavy to run efficiently. That said, Maxwell’s technology has found uses in the auto industry. It counts Volvo-owner Geely, General Motors, and Lamborghini as customers, which can use ultracapacitors to absorb energy when braking and then release it when the car accelerates. But that’s likely not a technology a carmaker would spend hundreds of millions of dollars to acquire, reckons Venkat Viswanathan, a battery expert at Carnegie Mellon University. A more likely reason Tesla bought Maxwell is for the latter’s dry electrode technology, “the early results of which look promising,” according to Ravi Manghani, director of energy storage at Wood Mackenzie. Though not in commercial use yet, Maxwell claims the technology helps batteries pack in more energy and cut costs by as much as 20%. It has revealed some of the technical details over the years, with this study (pdf) providing the most public information to date. Lithium-ion batteries are made using a technology that was pioneered to make magnetic tapes in the 1970s. It involves mixing the chemicals in the batteries’ electrodes with a solvent to make a slurry. The slurry is coated on a conductive metal, such as copper or aluminum, that can transport the electrons generated for use in devices and electric cars. The coated material is then passed through long ovens, where the solvent evaporates and the dry electrode is prepared for packaging into a battery. Maxwell’s technology uses a binding agent and a conductive agent, instead of a solvent. The process could help make the electrode thicker than conventional practices. The more electrode material in a battery, the more energy it can store. Maxwell claims this could boost battery capacity to 300 Wh/kg, a 20% jump over the best available electric-car batteries. A battery executive at a rival company said that Maxwell’s acquisition suggests Tesla is looking to cut its reliance on Panasonic. For years, Tesla and Panasonic have enjoyed a monogamous relationship when it comes to electric-car batteries. But recently, fractures have appeared. In January, Tesla announced that it is open to using batteries from Chinese companies for the cars made in the Shanghai Gigafactory currently under construction. (The Chinese government stipulates that subsidies are only paid for electric cars that use China-made batteries.) Around the same time, Panasonic announced a partnership with Toyota to develop next-generation batteries. Perhaps there is a simpler, less conspiratorial reason for the acquisition. 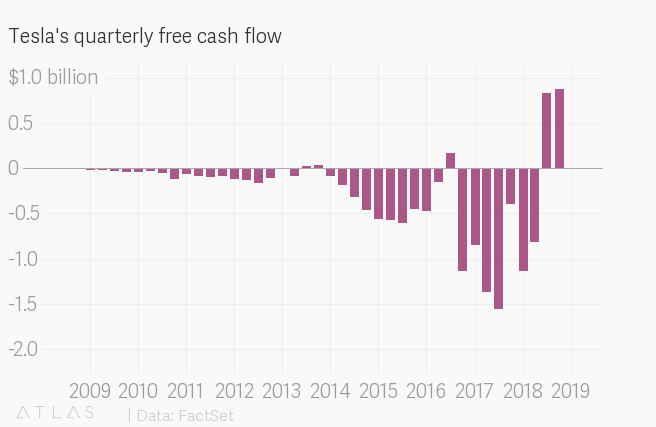 Tesla watchers have long fretted about the company’s cash flow, which only recently turned positive. As Musk looks to steer the company on a sustainable financial path, it’s looking to cut costs while meeting ambitious production targets. It’s possible that the Maxwell acquisition could help Tesla boost its cash flow. Dry electrode technology promises to cut the cost of lithium-ion batteries in a specific way. When there’s no solvent in the process, there’s no need for long ovens for the drying process. This greatly reduces the floor space needed to produce these sorts of batteries. In that sense, even if the Maxwell acquisition makes only a marginal improvement to the energy density of Tesla batteries, it still contributes to the bottom line. As the company looks to deliver on its promise of the $35,000 mass-market Model 3, whatever helps in lowering the cost of production will be welcomed. As another battery executive put it, the lower capital expenditure could make a “radical” difference to Tesla’s long-term prospects. 🌎 Quartz is running a series called The Race to Zero Emissions that explores the challenges and opportunities of energy-storage technologies. Sign up here to be the first to know when stories are published.